Florals don’t always have to be girly and bright – and they don’t have to be worn exclusively in the spring or summer either. For a fall-ready take, I always look for pieces that have darker prints against lighter backdrops. It’s the perfect mix to help bring the gap between summer and fall! I made the mistake of falling in love with this kimono during the #Nsale but decided not to get it. I then had so much regret, I ended up buying if after the sale and paying full price. Lesson learned. If you can’t stop thinking about it – BUY IT! I love kimonos with shorts! This color says Fall, I’m ready! You look fantastic and so much fun! Your sis is going to be overjoyed with your hosting skills! I know it will be perfect! Have a ball my beautiful friend! I love this floral kimono. So glad you got it!! It’s perfect for Fall. Good luck this weekend, I know it will be amazing!! This is such a great fall floral- and you know I love a duster! They can be so glam! Such a cute outfit and love that handbag! Shauna, this kimono is everything! I am in love with the color, so fabulous! this kimono is stunning on you, the color is purely fabulous! haha you’re gonna need more than a PSL –have fun at the shower& try (really try) not to stress too much! Love with the shorts and booties….perfect transitional outfit. Try not to stress…keep it simple and have fun! Always buy it! I have learned that lesson too many times for sure. I love the kimono though and wish I had snagged it too! This floral print just speaks fall to me! I love the burnt orange/brown color and goodness, there are even some leaves in the same color on the street! You just always find the best locations for your photos! Love!! wow this kimono is so amazing!! Yaaaahhsss!!!! I almost got this kimono but found a similar one and fell in love with the print! The dark yellow color is giving me life! Love how you styled it! Love the unique color and print of this kimono! The perfect piece for early fall! Enjoy your weekend! I love that floral is good for fall and this color is amazing! This kimono is EVERYTHING! Such a fabulous transitional look! Perfect transition kimono to fall 😉 Lovely outfit and colors! I LOVE this floral kimono! The colors make it perfect for fall and since it’s longer it’s so great to transition into cooler weather! Gorgeous!! 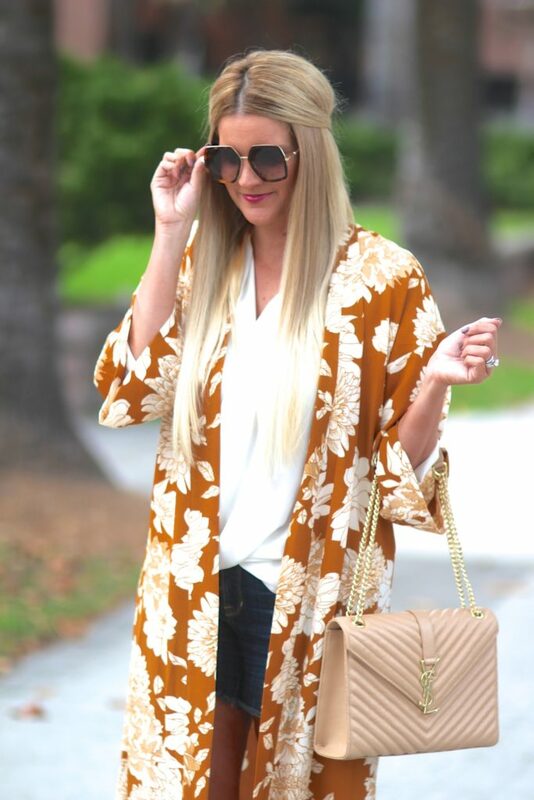 This floral kimono is fall perfect, Shauna! And love how you paired it with shorts for your warm CA weather. Good luck with the shower this weekend! I know everything will be perfect!! Happy Friday! Such a beautiful kimono style cardigan. The colors are just screaming fall. Great pairing the kimono with shorts. You look fabulous. I’m in love with that kimono! The color is beautiful, and so perfect for fall. Have fun hosing your sister’s bridal shower! Lovely kimono dear! I love the color, really perfect for fall. That is such a beautiful kimono! I love the colour, like you said it will go perfectly into your colder weather wardrobe with the darker colour. Hope you are having a lovely weekend and the shower went well! What a gorgeous kimono! I can see why you couldn’t stop thinking about it. I hope the bridal shower was a huge success.